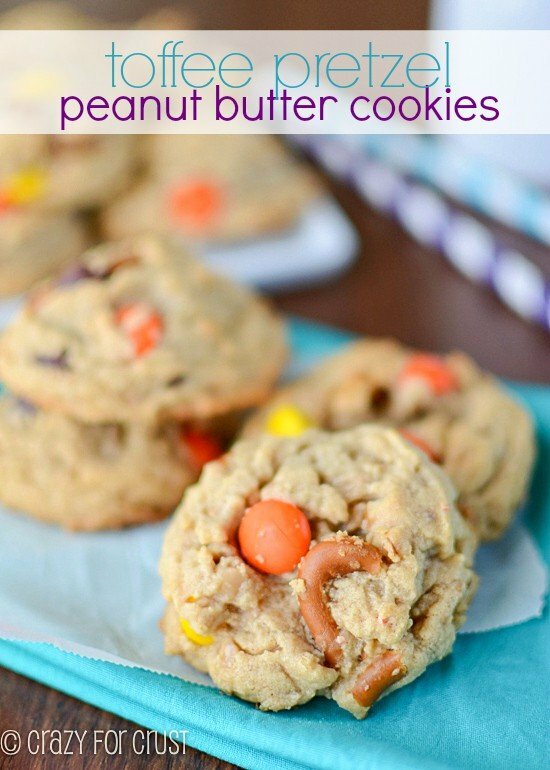 Cookies ‘n Cream Peanut Butter Cookies – Thursdays are just better with cookies, don’t you think? Make them peanut butter cookies filled with chopped Oreos and it would be a red-letter day, at least for me. Social media never ceases to amaze me. In the span of 5 minutes you can ask a question in a group, plan a family reunion, get a recipe for cookies ‘n cream peanut butter cookies, connect with an old friend, see some funny cat pictures, and realize that humanity, for all those good things, is really going down the drain. 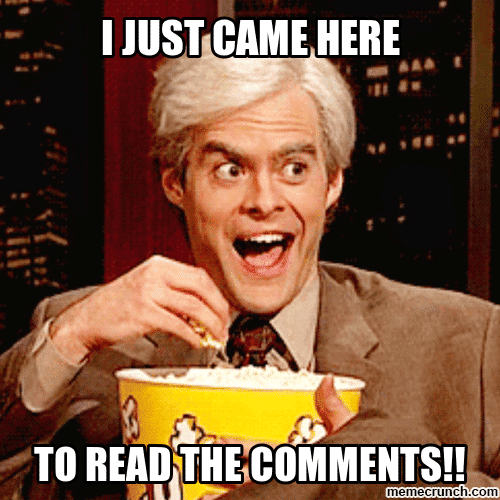 I don’t know about y’all but I spend a looooot of time on Facebook. Probably more than I should. Actually, I do spend more time on there than is probably recommended by most doctors. I say it’s for work, and most of the time it is. I’m in approximately 1,234 blogger groups (give or take 10) where I ask/answer questions or drop links and pin, tweet, yum, stumble, comment, share, link every day. I always tell myself: I’m gonna go drop some links, pin some stuff, schedule my FB page for tomorrow and then I’m going to walk away. I end up scrolling the home feed. Over and over. And checking my notifications. Oh, the endless notifications. You may ask why my faith in humanity is shattered after spending 5 minutes on Facebook. Well, for one, it’s because people have no filter. We’ve talked all about that before. But it also seems that people on (at least my Facebook page) don’t like it when I post non-food things. I mean, I know I’m a food page but I’m also “baking…with a slice of life.” Plus, I have a brain in my head…at last check anyway. Sometimes asking things like “Cookies or Cake??!! !” every day makes me bored. I like to ask other things and provoke conversation. Both of those conversations were like this for me. I never learn though because this afternoon, about approximately 2:55pm pacific time I’m posting another parenting question on my FB page. This one will be about overscheduling tween activities. Be sure to come join in the fun! And while you’re sitting back in your recliner watching the comments that read like a bad train wreck, maybe you should enjoy some cookies. 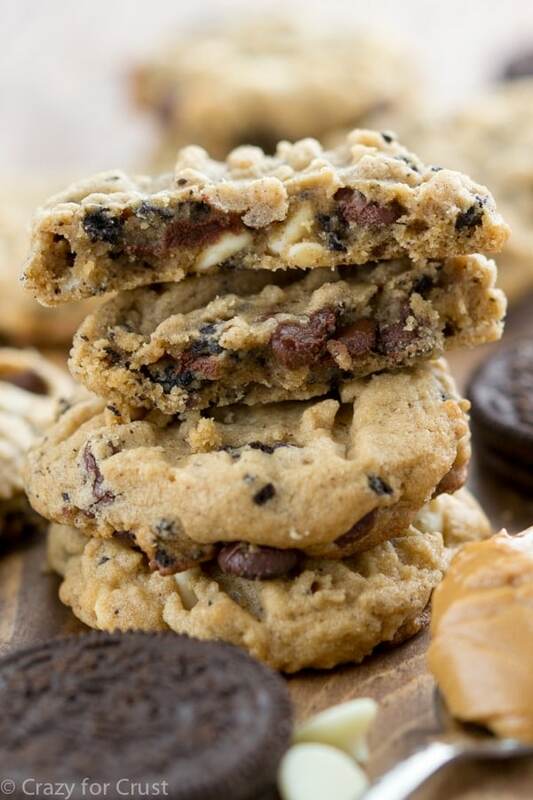 Peanut butter cookies filled with chocolate, white chocolate, and crushed Oreo cookies. 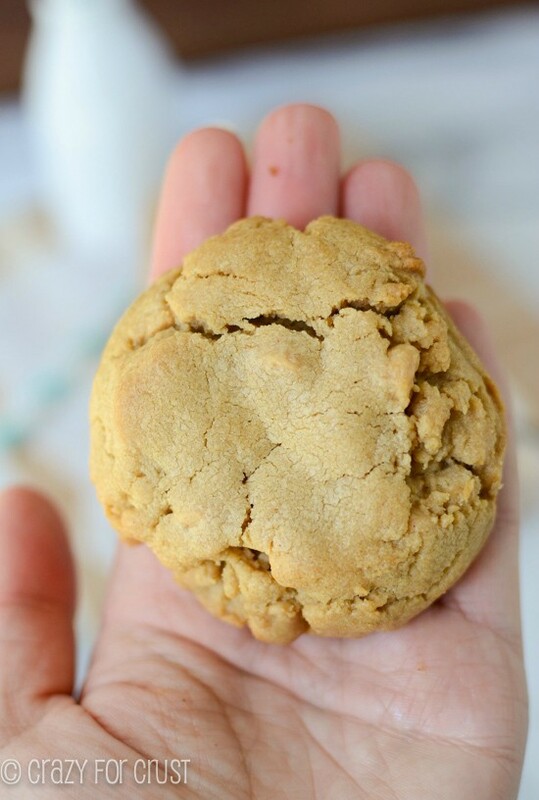 It’s the trifecta of awesome in a peanut butter cookie. 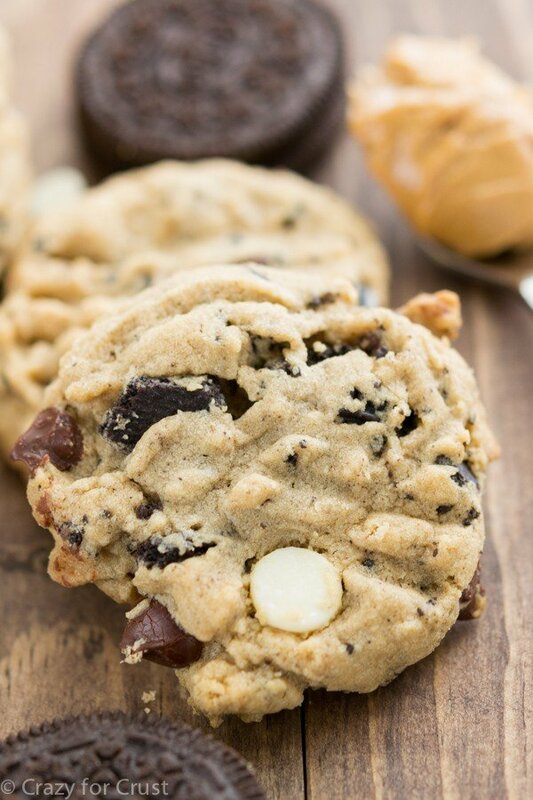 It’s a cookies ‘n cream peanut butter cookie! These make a few dozen cookies. They keep well on the counter for several days, or you can freeze them for cookie emergencies. I don’t chill the dough, but I like to run a fork over the top to give them that traditional peanut butter cookie look. Because then they scream peanut butter cookies. And the Oreo chunks scream cookies ‘n cream. And I scream GET IN MY BELLY. So what’s your opinion on cookies ‘n cream peanut butter cookies? I’m assuming y’all will be a little less judgmental than the nice folks over on my FB page. But cookies aren’t controversial. My favorite peanut butter cookie recipe filled with chocolate chips, white chocolate, and crushed Oreo pieces! Preheat oven to 350°F. Line 2 cookie sheets with parchment or silpat baking mats. Cream butter, peanut butter, and both sugars in the bowl of an electric mixer fitted with the paddle attachment. Add egg, vanilla, milk, salt, and baking soda. Mix until combined. Slowly add flour and mix until dough comes together. Stir in both kinds of chocolate chips and chopped Oreos. Scoop 2 tablespoon sized balls of dough. Use a fork to make a small criss-cross pattern on the top. Bake for 8-10 minutes, until they just begin to brown. Cool completely and remove from cookie sheets. These are amazing! The next batch of cookies made will be these! Oh man. Social media. Love-hate relationship if there ever was one. You just keep doing what you’re doing. You rock! And these cookies are the bomb. I need these in my life ASAP! These cookies are absolutely fantastic!!!! Cookies and cream and peanut butter together are magical! I love your “controversial” questions! Haha. And these cookies sound great, definitely loving the trifecta going on. 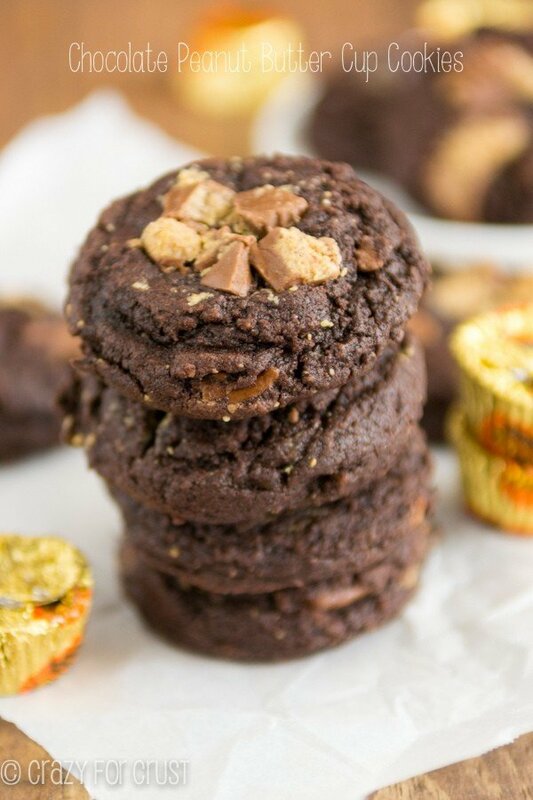 I’ve never tried oreos with peanut butter but I definitely want to try these! I think every day is better with cookies, but especially with these cookies. I mean peanut butter and oreo are one of my favorite combos in the whole world! I love this combination! 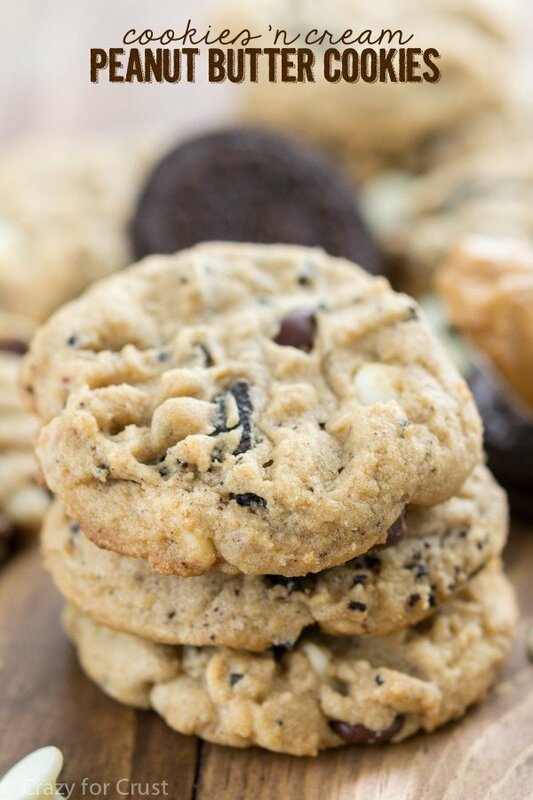 Cookies and cream and peanut butter in a cookie is just plain awesome! Pinned! lol I think we all fall into the FB hole! I love how much engagement you get with those convos on your page-so fun! and these cookies are ahhhmazing. I love the pb + oreo combo and they look delicious!